The researchers say the technology could offer an easy-to-use, less-expensive way to engineer organisms that produce biofuels; to design animal models to study human disease; and to develop new therapies, among other potential applications. To create their new genome-editing technique, the researchers modified a set of bacterial proteins that normally defend against viral invaders. Using this system, scientists can alter several genome sites simultaneously and can achieve much greater control over where new genes are inserted, says Feng Zhang, an assistant professor of brain and cognitive sciences at MIT and leader of the research team. “Anything that requires engineering of an organism to put in new genes or to modify what’s in the genome will be able to benefit from this,” says Zhang, who is a core member of the Broad Institute and MIT’s McGovern Institute for Brain Research. The first genetically altered mice were created in the 1980s by adding small pieces of DNA to mouse embryonic cells. This method is now widely used to create transgenic mice for the study of human disease, but, because it inserts DNA randomly in the genome, researchers can’t target the newly delivered genes to replace existing ones. In recent years, scientists have sought more precise ways to edit the genome. One such method, known as homologous recombination, involves delivering a piece of DNA that includes the gene of interest flanked by sequences that match the genome region where the gene is to be inserted. However, this technique’s success rate is very low because the natural recombination process is rare in normal cells. More recently, biologists discovered that they could improve the efficiency of this process by adding enzymes called nucleases, which can cut DNA. Zinc fingers are commonly used to deliver the nuclease to a specific location, but zinc finger arrays can’t target every possible sequence of DNA, limiting their usefulness. Furthermore, assembling the proteins is a labor-intensive and expensive process. Complexes known as transcription activator-like effector nucleases (TALENs) can also cut the genome in specific locations, but these complexes can also be expensive and difficult to assemble. The new system is much more user-friendly, Zhang says. Making use of naturally occurring bacterial protein-RNA systems that recognize and snip viral DNA, the researchers can create DNA-editing complexes that include a nuclease called Cas9 bound to short RNA sequences. These sequences are designed to target specific locations in the genome; when they encounter a match, Cas9 cuts the DNA. This approach can be used either to disrupt the function of a gene or to replace it with a new one. To replace the gene, the researchers must also add a DNA template for the new gene, which would be copied into the genome after the DNA is cut. 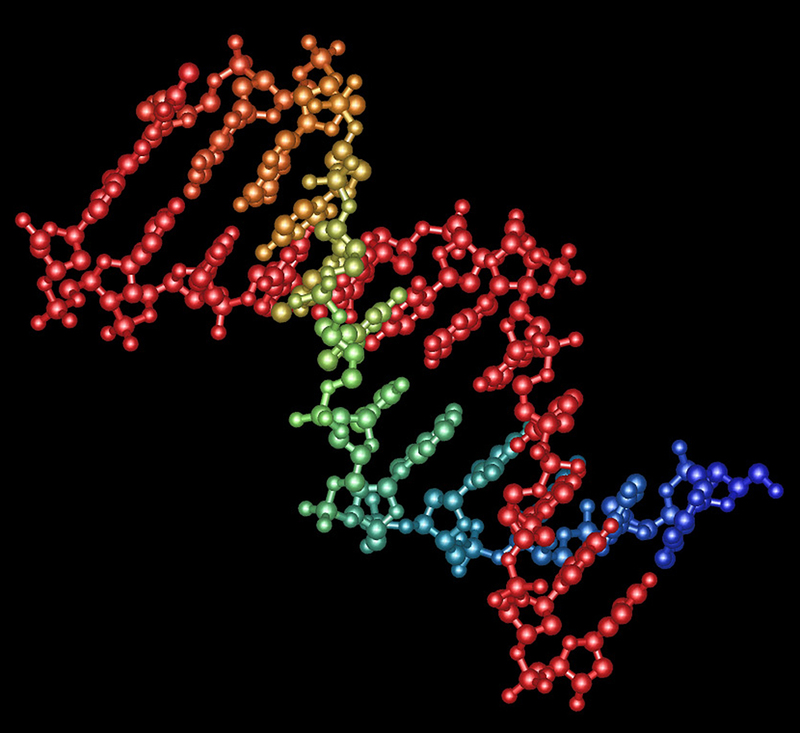 Each of the RNA segments can target a different sequence. “That’s the beauty of this — you can easily program a nuclease to target one or more positions in the genome,” Zhang says. The method is also very precise — if there is a single base-pair difference between the RNA targeting sequence and the genome sequence, Cas9 is not activated. This is not the case for zinc fingers or TALEN. The new system also appears to be more efficient than TALEN, and much less expensive. The research team has deposited the necessary genetic components with a nonprofit called Addgene, making the components widely available to other researchers who want to use the system. The researchers have also created a website with tips and tools for using this new technique. Among other possible applications, this system could be used to design new therapies for diseases such as Huntington’s disease, which appears to be caused by a single abnormal gene. Clinical trials that use zinc finger nucleases to disable genes are now under way, and the new technology could offer a more efficient alternative. The system might also be useful for treating HIV by removing patients’ lymphocytes and mutating the CCR5 receptor, through which the virus enters cells. After being put back in the patient, such cells would resist infection. This approach could also make it easier to study human disease by inducing specific mutations in human stem cells. “Using this genome editing system, you can very systematically put in individual mutations and differentiate the stem cells into neurons or cardiomyocytes and see how the mutations alter the biology of the cells,” Zhang says. In the Science study, the researchers tested the system in cells grown in the lab, but they plan to apply the new technology to study brain function and diseases. The research was funded by the National Institute of Mental Health; the W.M. Keck Foundation; the McKnight Foundation; the Bill & Melinda Gates Foundation; the Damon Runyon Cancer Research Foundation; the Searle Scholars Program; and philanthropic support from MIT alumni Mike Boylan and Bob Metcalfe, as well as the newscaster Jane Pauley.